Where has all the drugstore nail polish gone? You can tell nail polish has peaked with the general public. I used to see new or LE drugstore polish collections popping up every few months 2 years ago. Now, I rarely see anything new nail polish wise from the drugstore. This really bums me out. L'Oreal did happen to lift my spirits a bit when I saw a new collection from them called Nautique featuring nautical and American themed colors. One of the colors I picked up was perfect for my July 4th mani! Raise the Flag is a mixture of satin red, white, and blue mini bar glitters in a clear base. Color: Not much to say about color here. 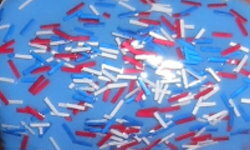 This is a great glitter mix of colors for any patriotic themed mani. I will say, I'm not typically a fan of bar glitter at all, but I actually really like these. They're so fine and small that it does create a cool effect on the nails! Formula: The formula on this was really good and easy to apply. I didn't have any trouble getting this glitters to apply and spread out on the nail. Price: I paid around $5-$6 for this at Walgreens. Overall: I really love the look of Raise the Flag. 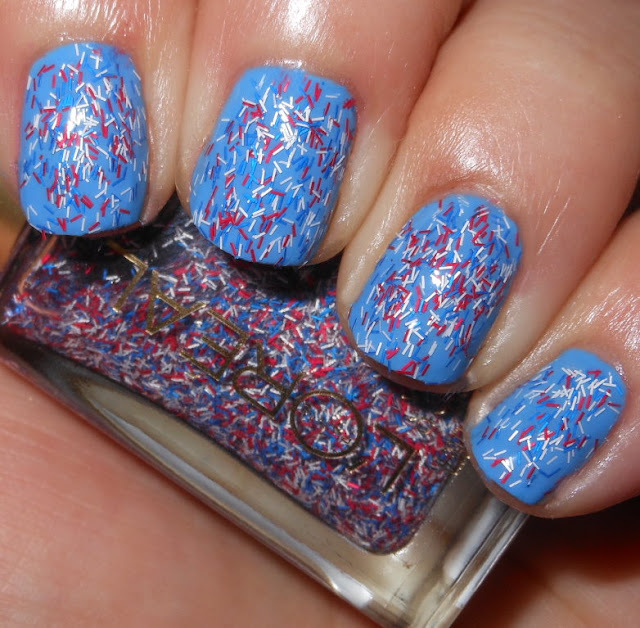 I think it's a fun and fresh take on a patriotic glitter. What I like about it most is the effect it creates on the nails. If you're painfully nail art challenged or just lazy like me, this glitter really looks like you did some fun nail art technique on your nails without the effort! Happy Friday and Happy 4th of July tomorrow! Not a huge fan of bar glitters but this one looks fun. I do like this...I went with Sinful Colors glitters for my July 4th holiday mani...probably the only time I'm willing to wear star glitter!! It's still pretty good here in Australia - Essence and Ulta3 are always bringing out new colours at a good price point. I feel like part of the lack of releases from the usual drugstore brands like Sally Hansen etc is the focus on the 'no lamp gel' polishes, which I have zero interest in. Well, I still love nail polish - come on drugstore brands! We need the good stuff :) I think there is still good stuff though, just that we have to search for it a little more. I'm glad you still have nice drugstore polish in Australia! I'm not into the gel polish stuff either. We do need good stuff. I've been searching, and I'm mostly coming up dry :(.